Help! I'm stranded in a wormhole. What do I do? Please head over to our in-game public channel, "Eve-Scout", and ask for a Signal Cartel member to guide you to one of our rescue caches or to help set up a search and rescue request. If you would like to be more discreet, you can EVEmail Thrice Hapus to further discuss rescue options. What is the Rescue Cache program? 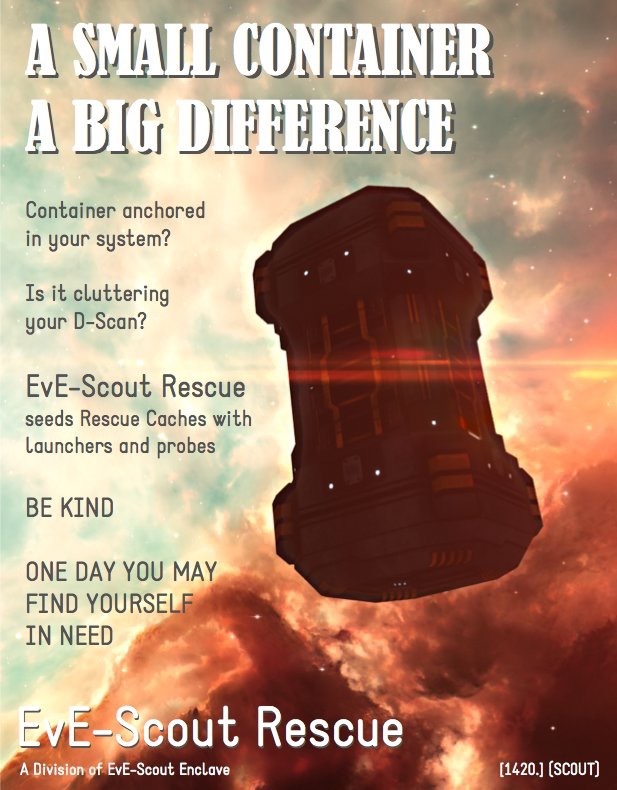 The EvE-Scout Rescue Cache (ESRC) program, founded in early YC 118 by Forcha Alendare, provides a basic emergency resource kit for capsuleers stranded in wormholes, regardless of alliance, sovereignty, or play style. ESRC is only one facet of the EvE-Scout Rescue division, a dedicated group of Signal Cartel pilots who have answered to call of service to the greater New Eden community. As well as being a service to the EVE community, this program provides Signal Cartel members an opportunity to expand their exploration experiences, wormhole lifestyle, and game play content. What is a rescue cache? A rescue cache is a small secure container that contains one (1) core probe launcher and eight (8) core scanner probes (and, usually, a few "hugs" [fireworks, snowballs] or other trinkets for fun) which is anchored somewhere in a wormhole. When a capsuleer is stranded and in need, they can contact a Signal Cartel scout in the public EvE-Scout channel for assistance. If the contents of a cache meet the stranded capsuleer's need, the scout will look up the rescue cache's location and password, provide these to the stranded pilot, and assist them in locating and gaining access to it. Who won't be helped by a rescue cache? 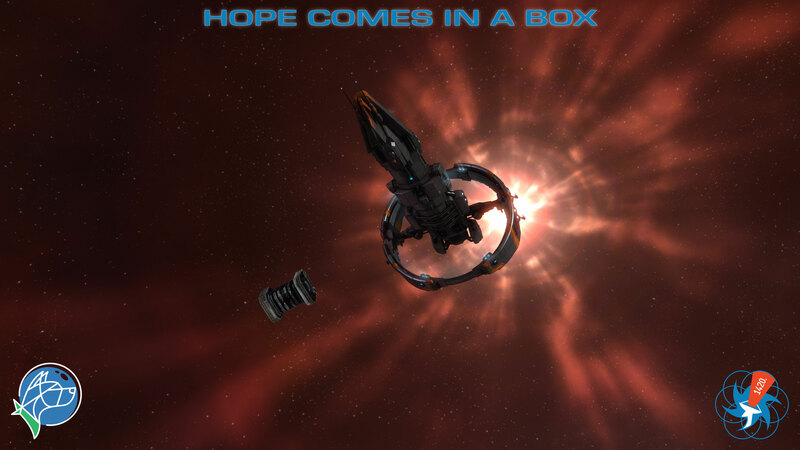 Because a rescue cache is a small secure container that contains a minimum of one (1) core probe launcher and eight (8) core scanner probes, it will not be any help to you if you do not already have a probe launcher fitted to your ship, if you do not have a way to change your fit in your current wormhole, or if you no longer have a ship at all! In these cases, be sure to contact us to arrange for a search and rescue request to go out to our network of rescue pilots. I live in this wormhole. Do your rescue operations present any threat to me? Wormhole space is, by design, lawless and unconquerable. It is these qualities that necessitate our rescue programs in the first place! While we respect the inhabitants of every wormhole, it is not feasible to try to contact wormhole locals or residents regarding our operations in "their" system. Because wormholes do not allow for sovereignty, it is impossible to tell for certain who "owns" a hole. But have no fear! The resources we leave behind do not provide any actionable intel nor do we share information about our travels with any third parties. Additionally, our pilots are instructed to avoid placing rescue caches within d-scan range of POSes or Citadels whenever possible, so as to reduce d-scan clutter and potentially unwanted traffic near an anchored structure. For further inquiries regarding EvE-Scout Rescue's initiatives or policies, or to discuss any concerns you might have about rescue operations in the wormhole where you reside, please contact Thrice Hapus via EVEMail. Why do you do this? What's in it for you? The pilots of Signal Cartel, the core corporation of the EvE-Scout Enclave alliance, abide by a strict Credo that emphasizes service to the capsuleer community of New Eden, respect to all regardless of affiliation or play style, non-aggression, friendship, kindness, and grace under pressure. Within Signal Cartel, each pilot is encouraged to participate in and invent ways to embody all that the Credo envisions. Our rescue programs are merely one of the myriad ways our pilots strive to live up to that high calling. There are many reasons capsuleers fly in New Eden: glory, fame, riches. Our pilots do so to be a part of one of the greatest stories of our time. We derive our glory, fame, and personal reward from the magnificent narrative tapestry we are weaving together. One of our favorite corporate pastimes is sharing with one another stories of successful rescues that occur as the result of our various rescue programs. We are grateful to you for granting us this unique opportunity!